Tonight was good, completely worth repeating. It was tasty, easy and fast - and a great way to take advantage of the piles of fresh asparagus that are at farm stands and the supermarket. Tonight I served this atop mostly-white omelettes: delicious. Leeks have an almost-sweetish onion essence. Paired with butter, they are delicious. When seeking a sweet touch of onion, why not use a "sweet onion" like a Vidalia? Sweet onions lose their onion-oomph when cooked so are best used raw. Leeks, however, will impart that sweet touch. Melt butter in a skillet over MEDIUM HIGH. Reduce heat to MEDIUM, add leeks and stir well to coat. Saute lightly until soft, about 3 minutes. Cut asparagus in one-inch lengths and add to skillet, turning well. Cover. 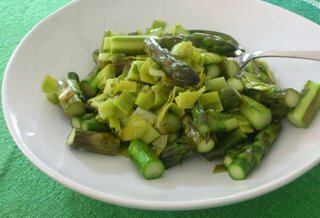 Let cook, stirring occasionally, until asparagus is cooked through but still bright green, about 5 minutes for thin spears, about 15 minutes for thick. Season with salt and pepper to taste and serve. As they grow, leeks collect grit between their layers. Luckily, cleaning them is easy. First slice off the dense part of the root end, crosswise. Then slice off the leaf end, leaving about an inch of light green leaves. The cut piece will probably be about six inches long. Now cut the leek in half, lengthwise. Wash each half under running water, using your hand to loosely separate but still gather the layers. Cut leek halves crosswise into 1/2 inch half-rounds. June 2006 Note: In 2005, I made these with thin spears of asparagus and called them "preferable". And they are preferable, if you're in a rush, for they cook more quickly. But for flavor, I'm learning to especially appreciate the fat spears.